Michael A. Elliott, Asa Griggs Candler Professor of English, has been appointed dean of Emory College of Arts and Sciences, starting July 1, 2017. Elliott has served as interim dean of Emory College since August 2016. As dean, Elliott will lead the university’s core undergraduate division, which includes more than 5,600 students and 550 faculty. He will play a critical role in supporting and expanding the liberal arts and sciences within the university and beyond, while also working with other leaders to advance the college’s strategic priorities, relations with alumni and donors, and its business, teaching, research and service missions. In the past nine months as interim dean, Elliott has worked closely with faculty and other key stakeholders to set the strategic priorities for the college moving forward. He has taken an active role in supporting the university’s Undergraduate Experience Initiative, and he began implementing new initiatives to diversify the faculty, and improve the recruitment and retention of top scholars. He also has engaged with alumni and donors around the country in supporting the college’s goals for the Scholarship Endowment Initiative. “I am truly honored and humbled to take on this role. 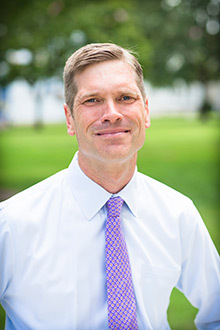 I look forward to working with faculty, students and university leadership to fulfill our ambitions to set the standard for what can be achieved as a college of arts and sciences within a liberal arts research university,” says Elliott, who joined Emory in 1998 after earning his PhD from Columbia University in English and comparative literature. “Emory College is dedicated to integrating the discovery and dissemination of new knowledge — and the creativity of our faculty and students constantly astounds me. One of my primary goals as dean is to find ways for that enterprise to have an even greater impact on the world,” says Elliott. Elliott has served in a variety of leadership roles while continuing to work closely with students and on his own scholarship, which focuses on the literature and culture of the United States from the mid-19th to early-20th century. He was honored with the Emory Williams Distinguished Teaching Award in 2008. Most recently, he oversaw the launch this year of a $1.2 million effort that positions Emory as a national leader in the future of scholarly publishing. The Andrew W. Mellon Foundation is funding the multiyear initiative to support long-form, open-access publications in the humanities in partnership with university presses. Elliott helped lead Emory College as senior associate dean of faculty from December 2009 to July 2014, with responsibilities that included academic planning and program evaluation; faculty hiring, development, tenure, promotion and retention; and collaboration with the Emory College development and alumni team, among other responsibilities. In August 2014, he became executive associate dean for Emory College, where he coordinated the work of the senior associate deans with leadership in Emory College operations, including finance and human resources. He played a central role in the college's self-study and external review process, and acted as a liaison to the Office of the Provost, Laney Graduate School, Campus Life and administrative units across campus. The recipient of several prestigious research fellowships, he has authored two books on subjects related to American literary and intellectual history. He also serves on the editorial board of The Norton Anthology of American Literature. Emory was assisted in the search for its new dean of Emory College of Arts and Sciences by Heidrick and Struggles.